It’s being billed as the “Biggest Live Music Event in Radio History,” though I’m not exactly sure I know what that tagline means. In any event the inaugural iHeartRadio Music Festival will take place from September 23-24, 2011 at the MGM Grand in Las Vegas, NV. Top of the bill headliners include Lady Gaga and Coldplay and the whole event will be streamed via iHeartRadio.com and their various mobile apps. The event, while being marketed as traditional a music festival, will also serve double duty as a launch pad for the new version of the iheartradio website and its associated mobile apps. 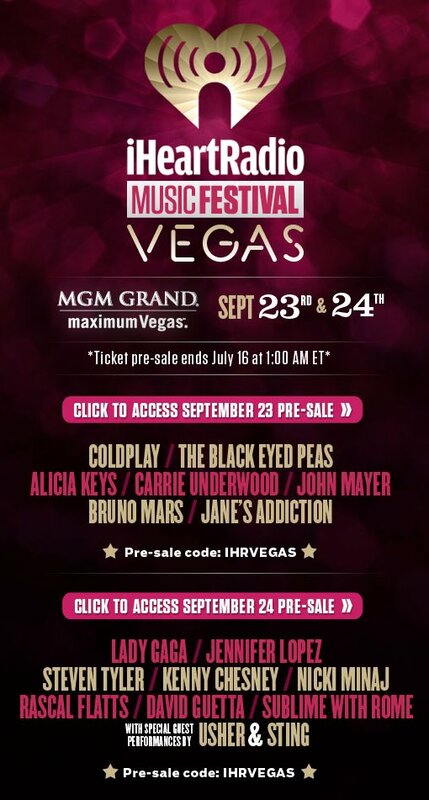 Tickets are currently on presale for both days of the festival and the password is IHRVEGAS. General on sale begins at 1PM ET on Saturday, July 16, via Ticketmaster.com. View the full pop heavy iHeartRadio Music Festival lineup after the jump.